Madison-based women's a cappella ensemble greenTONE sings at Cave of the Mounds in Wisconsin. WUWM's Maayan Silver reports on a unique holiday tradition: Christmas caroling underground. It's a little unusual to hear Christmas caroling underground, especially in a cave that's nearly a million years old. But that's what hundreds of people did in December in southwestern Wisconsin. For over a decade, the staff at Cave of the Mounds, which is 30 miles west of Madison, have brought a cappella groups, choirs and orchestral quartets to the limestone cave to kick off the Christmas season. Stalactites (above) and stalagmites (below) in Wisconsin's Cave of the Mounds. 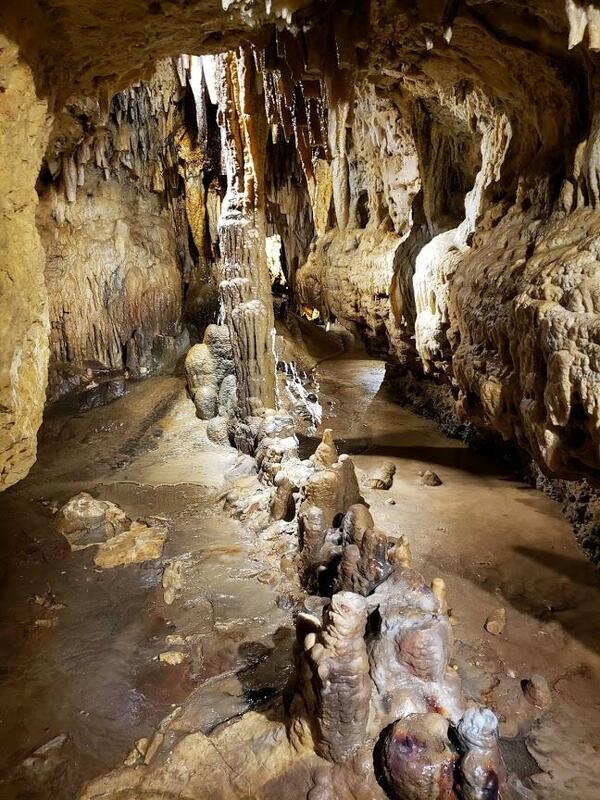 It's a gentle descent into Cave of the Mounds and just a short stroll to the north cavern, the cave’s largest “room." Inside, people sat next to the brown, wavy limestone walls of the cave and the space was lit up by Christmas lights and candles. Performing as was the greenTONE group, a Madison-based, all women’s a cappella ensemble. Laura Kruschke, the founder, director and vocal percussionist. She describes singing in the cave with the magical surroundings. “It’s kind of a major feeling of exhilaration. That’s probably the easiest way I can describe it. It feels sometimes when everything locks into exactly the right place, it feels like my feet don’t touch the ground," she says. For 12 years, carolers have brought music to the caves during the holidays. All proceeds are donated to a charity of their choice. This year, greenTONE chose to donate to Gilda’s Club of Madison. And it’s personal: one of the greenTONE singers is a cancer survivor. Singing Christmas music in the cave particularly special, says Kruschke. "It marks our year. It’s a landmark event for us. If we have nothing else to sing for, we begin singing our holiday music in June or July to start feeling like we’re ready by December,” she says. But it’s not just the music that’s magical, it’s also the setting. 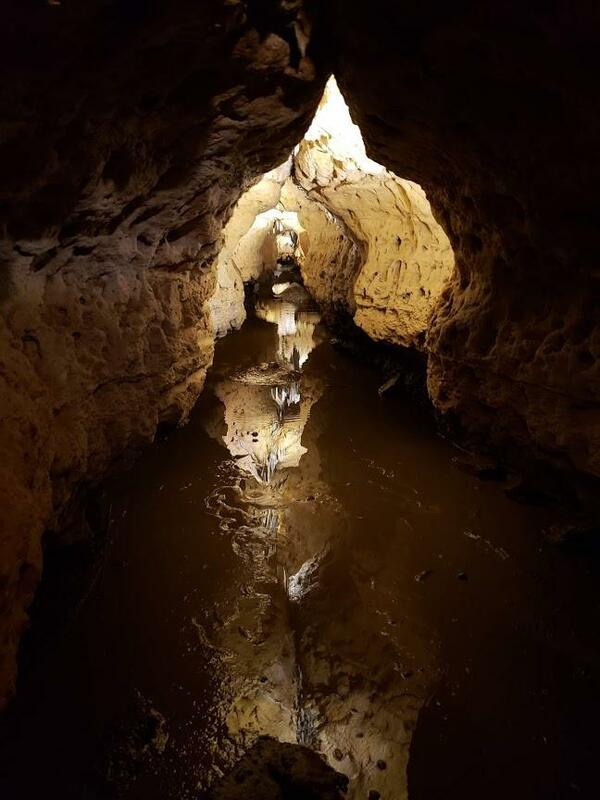 The manmade tunnels protect the formations of the cave, including stalactites (they hang from the top down) and stalagmites (they generally grow from the bottom up), according to Cave Operations Manager Kim Anderson. Under the formations is a glimpse into what was around even before the cave itself. "You can really see the layers of limestone. And that’s the foundation of Wisconsin," she says. "That rock started forming 400-500 million years ago from ancient sea sediment." The cave is also pretty damp and watery. Anderson says that also has to do with the limestone. "So, there’s fossils in it, there’s little vugs [note: cracks and fissures opened by tectonic activity], and that’s what the water travels through." The dripping adds to the caves soundtrack and splashes people — or their cell phones — on occasion. And in this dark, wet cave, the weird thing is: visitors want to sing. In fact, people on cave tours have been doing it for years. "Maybe it’s a family that sings at their church, maybe it’s a gospel choir group," says Anderson. "An Amish family came one time and they wanted to sing. We’ve had some Mormons come and want to sing. When they were really belting it out we were like, ‘Wow, that’s amazing!’ Different areas of the cave sound really great." Audience members at greenTONE performance. So, what is it about the cave that compels people to sing in it? "I think the reverberation and the reflection of sound and how sound resonates throughout the passageways, really. And also, how it can change from room to room depending on how high the ceilings are, how low the ceilings are, how wide the passageways are and that sort of thing," she says. Water pooling in a tunnel in the cave. 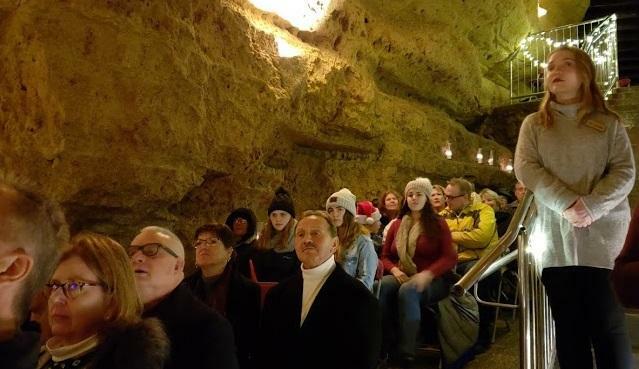 Because the cave is a balmy 50 degrees year-round, Caroling in the Cave became a way to let people know they can come to the tourist attraction in the Wisconsin winters. Mariah Sandmire is from Rio, which is more than an hour north of Madison. She says the group’s version of Leonard Cohen’s Hallelujah was her favorite. "My heart just warmed hearing it, and it just made me smile, it was amazing," she says. "I’ve heard [Hallelujah] so many times but never like that." Sandmire adds, "Christmas for me has always been a very special time, but this is just a good way to kick it off in my opinion. Katy Steudel, a friend of a friend who’s in greenTONE sums up the intersection of this Christmas tradition with the natural world. Wherever people celebrate Christmas around the world, they feast. It may be as simple as a bowl of porridge, but food rituals to mark the day as separate and special from all other days are practically universal. So often eating the food associated with this holy day helps families pause for a moment to remember who they are, and where they came from. What Do Milwaukee Chefs Cook Up for Christmas? Christmas. It’s a time of sugarplum fairies, reindeers, and stockings by the fireplace. It’s also a day for sharing food with family and friends. And on that day, it’s even common for chefs at restaurants to hang up their aprons and go home to cook and share a holiday meal with family.